That quote is often recounted on the first day of a proofreading class. It demonstrates an important lesson: great authors need a proofreader, even if they don’t always appreciate the profession. A proofreading course from a reliable provider will teach you to confidently tackle the manuscripts of any future Mark Twains. A thorough course will help you develop many new techniques and refine the language skills you already had. Many people think proofreading is all about finding typos and spelling mistakes, but there is, in fact, much more involved. The first lesson in a proofreading class usually covers what proofreading is and isn’t. 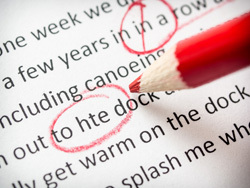 The aim of proofreading is to ensure that you do not submit articles filled with spelling errors and bad grammar. Ideally, an editor will have already worked on the text to make sure the message is clear. Many people confuse editing and proofreading, but the basic difference is that editing concentrates on the content, making sure the discussion or story is logical and coherent. Proofreading focuses on eliminating errors without changing the content. Proofreading is usually the final stage in any publication process, so proofreaders have the responsibility to be consistently accurate. Imagine you have to work on a 60,000-word manuscript. That’s about the length of a short novel. How can you possibly make sure that every word is spelled correctly and occurs in exactly the right place within its sentence? In a proofreading class, you will learn techniques for ensuring accuracy. One useful method for new proofreaders, especially for finding omitted and repeated words, is to read the text out loud. (Don’t worry, you won’t be asked to do this with a whole novel when you’re starting out.) The idea is to get you to slow down and look at each individual word. Usually, when we read, our eyes skim over the text, picking up patterns of words. As long as the first and last letters of the word are in the right place and the word looks about the right length, we will be able to recognize it. You can esaliy undresatnd tihs setnecne, for emxalpe. After some practice, you will train your eyes and brain to carefully examine the letters of each word without reading aloud. You’ll get steadily quicker, too. While proofreaders have to consider every word carefully, they have to work efficiently, too. For that reason, you will learn some useful shortcuts in a proofreading class. Just to make it even more confusing, a proofreading class will also teach you that even some correctly spelled words will be wrong in some circumstances. Take “color” and “colour,” for example. Some publishers will only accept the American English spelling (“color”), while others insist on British English (“colour”). As a proofreader, you will have to adapt to each publisher’s preferences. Fortunately, most major publishers, including universities, provide an overview of their particular demands in a style guide. Other publishers follow established style guides, such as the Chicago Manual of Style. In a proofreading class, you will learn about the different spelling rules of the many varieties of English and get a crash course in the most common style guides. Be sure to sign up for an accredited training course with a good reputation. ProofreadingCamp is where you will learn these lessons in detail and become skilled in many more proofreading techniques. The online proofreading course allows you to take your proofreading class anywhere, at any time.